The German Empire consisted originally of 27, and later (as of 1876) of 26 constituent states, the largest of which was Prussia. These states, or Staaten (or Bundesstaaten, i.e. federal states a naming deriving from the previous North German Confederation; they became known as Länder during the Weimar Republic). The governments of the federal states had votes in the Bundesrat, one of the chambers of the then German parliament. Several of these states had gained sovereignty following the dissolution of the Holy Roman Empire. 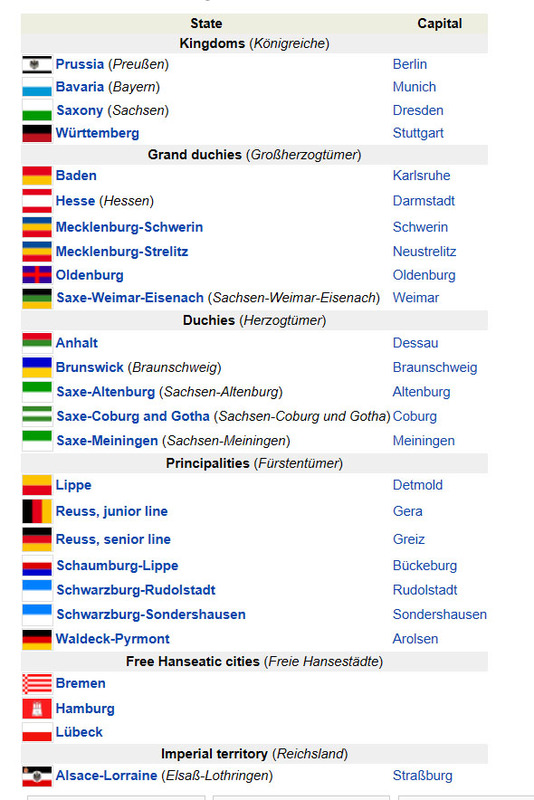 Others were created as sovereign states after the Congress of Vienna in 1815. 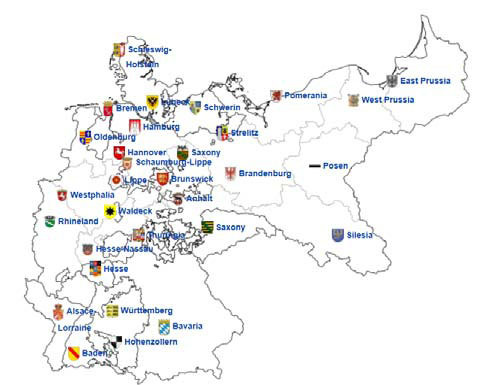 Territories were not necessarily contiguous, such as Bavaria, or Oldenburg— many existed in several parts (enclaves and exclaves), as a result of historical acquisitions, or, in several cases, divisions of the ruling family trees. the Palace of Versailles. The 1871 German Constitution was adopted by the Reichstag on 14 April 1871 and proclaimed by the Emperor on 16 April, which was substantially based upon Bismarck's North German Constitution. Germany acquired some democratic features. The new empire had a parliament called the Reichstag, which was elected by universal male suffrage.